pictures are ways of representing objects or events into a flat image for the reason of documenting. I started to photograph interesting moments or attractive combinations while I am making works. 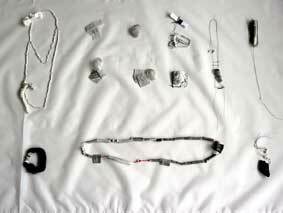 the drawings, written language photographs, and the objects I created. 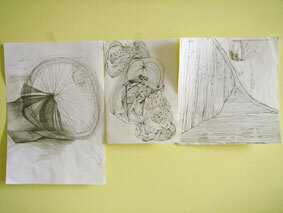 it slowly builds up the visual image which stimulates my brain and cooperates with my hands without planning. Using my hands as a tool instead of constantly drawing nonsense lines, I select materials to recompose a structure according to the material itself and accumulate the elements into a three-dimensional object. Coincidently, the object(item) looks like the drawing I drawn. There were several English words written on the scrap paper as another layer. rectangular shape as the result from the strict rule of correctly spelling. Chinese character is like a group of two or three blocks in flatten form, and people could place the groups of blocks freely. Looking at the objects I made and placing them on top of the white paper(photo.B), the image seems to flatten objects into characters following the same method of creating Chinese written language. As the result of that, I began to investigate the formation of the Chinese characters and how it relates to the process of my making. show that the method employed in calligraphy is close to the practice of western artists, notably Richard Tuttle and Eva Hesse. How do Chinese characters form, and how does a sign represent meaning? and shoulder blades of cattle, known as “oracle bones”. The written documents on the oracle bones were the evidence that the Chinese character had bee transformed from depicting concrete objects by using simplified characteristic strokes. These abstract symbols were then rearranged to formulate compound words to express more complicated ideas. the image as a sign in direct way. The Chinese written language is not as simple as it may seem following the diagrams of subjects, such as animals, houses, tools or human figures. “Picture-writing” and Compound pictographs were two of six methods1. Based on the six methods, the complex written language is created. Pictograph is the most direct and earliest way of creating Chinese character, which is the same as Sumerian cuneiform script and Egyptian hieroglyphics. The six methods of creating Chinese character are developed and categorized logically to reflect the complete nature of the Chinese writing system, and one method is derived from another in order to better satisfy the need of precise written communication. The six methods efficiently help people to express and exchange ideas and thoughts visually without miscommunication. extremely different, depending on the geographical location. An interesting example is that a Chinese and a Japanese might be able to understand each other perfectly well through exchanging notes because they share the same written characters even though the spoken languages are not the same. a very powerful representation for the readers, especially Pictographs and Compound Pictograph. 1. Pictography, Compound Pictographs-Ideograph, Loan Characters, Enlarged Loan characters, Characters with Derivative Meaning and Radical plus Phonetic Compounds.